Today I co-posted with David who writes the food blog entitled Cocoa & Lavender. 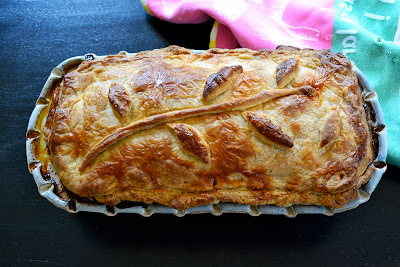 See his blog for one of the recipes mentioned in this post! We always harbor the hope that we will discover a good wine at a really reasonable (read: cheap) price. Who doesn’t? We’ve had some real duds in this quest—wines that wouldn’t even qualify as marinades and went straight down the kitchen sink—and we’ve made some terrific discoveries. 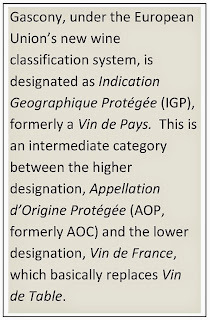 The wines from Gascony and its neighboring appellations definitely fall into the latter category. Gascony, to be clear, is not in Provence, the familiar stomping ground of The Modern Trobadors. 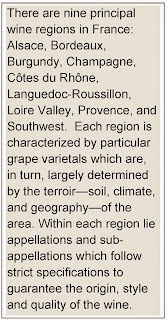 It lies about 300 miles (about 500 kilometers) away in what is called the Sud-Ouest (Southwest) wine region, of France. That’s a wine region? Yup. 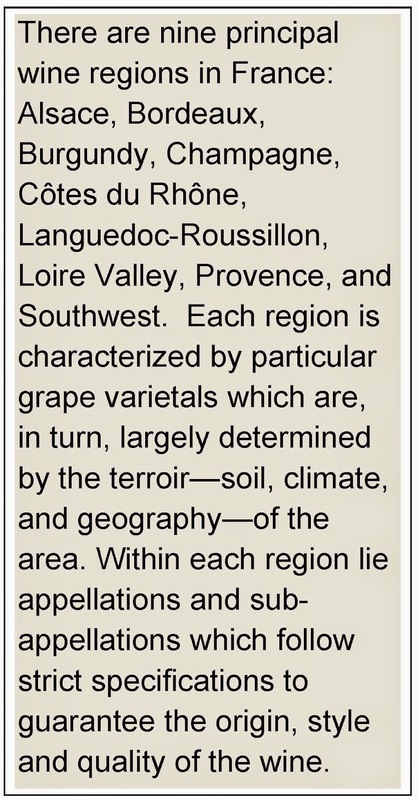 You know its neighbors, Bordeaux and Languedoc, but somehow this wine region of 30 or so appellations across 124,000 acres (50,000 hectares) of vines in some of the country’s lushest terroir has not yet established a regional identity outside of France. Southwest is fourth largest region in terms of volume, but very little of it is seen in the U.S. (although I hope this is changing). When we found out that Sud-Ouest wine production, like most of the South of France, began with the Romans, long before wines were made by its world famous neighbor Bordeaux and that, by the Middle Ages, the Sud-Ouest wines were in much greater demand, in France and in England, than the wine from Bordeaux, we were curious and wanted to know more. What we discovered are some really good wines at reasonable prices from a region of diverse producers who are united by their passion to produce excellent wines. Many Sud-Ouest vignerons have dedicated their careers to preserving rare grape varieties, even saving some from extinction, so that the grapes from which these wines are made are probably ones you have never ever heard of! 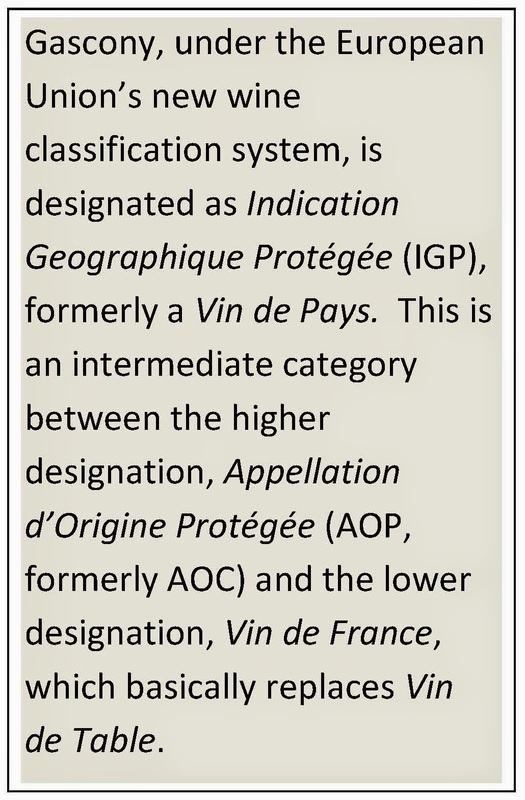 With grape names like Loin de l’Oeil (“far from the eye”) and Folle Blanche (“crazy white”) and appellation names like Irouléguy and Pacherenc du Vic-Bilh, we had to know more! What better way to get to know the wines from Gascony than to have a dinner party? I called David, good friend and author of the fabulous food blog, Cocoa & Lavender, to see if he was interested. He was game and came up with the menu based on the wines we had and we were off on a culinary adventure that begins in Gascogne. 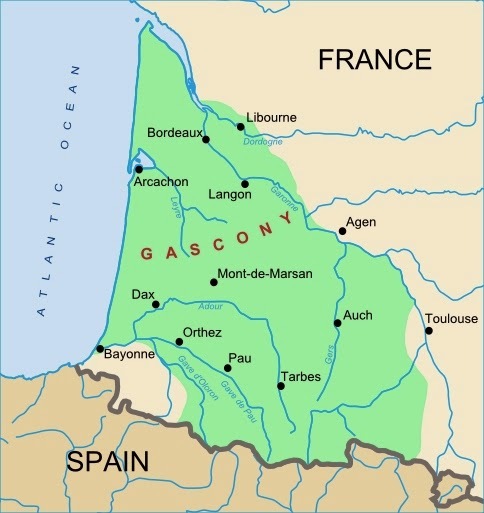 Gascony, as it is called in English, was once a much larger geographic region, encompassing all the land north of the Pyrenees, to the west of the Garonne River, up to and including Bordeaux. A beautiful area of verdant rolling hills dotted with medieval villages and lovely views of the Pyrénées Mountains in the distance, it has a long history of winemaking. 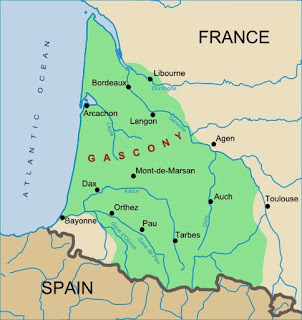 In the Middle Ages, all the wine from Gascony (and other inland areas) traveled along the Garonne River to the port of Bordeaux where it was sold or traded. By the 1300s, it was the Gascon wine that was especially coveted. As a result, nervous wine merchants of Bordeaux finagled the institution of a policy—La Police des Vins-– that basically required all the Bordeaux wine to be sold before any other wine could be sold or traded out of the port. Apparently there were other underhanded tactics back then that were instrumental in propelling the demand for Bordeaux beyond that for Gascony. the grapes—particularly Ugni Blanc and Colombard—went into Armagnac barrels and only what was left over was made into wine. Now, after being formally established as a wine district in 1982, most of the vineyards are devoted to wine. Not surprisingly, it is a white wine area with the principal grapes being Ugni Blanc (same as Trebbiano in Italy) and Colombard. Both dry (65%) and off-dry (15%) wines are made and the remaining 20% of production is evenly divided into reds and rosés. Our Gascon wines were both white: a Plaimont Colombelle L’Original (2011) and a Domaine de Pellehaut Harmonie de Gascogne (2011). The Colombelle is a combination of Colombard and Ugni Blanc grapes. We served it as an apéritif along with some very light nibbles of sweet potato chips and olives roasted with marcona almonds and shallots. This is an uncomplicated, light, and pleasant wine. We felt it was a nicely balanced wine with light bouquet and a tropical fruit finish. One person tasted “grapefruit” and another discerning palate tasted “grape skins”. This bottle typically retails for around $10 but I see it is on sale for $7 in Massachusetts. At these low prices, I can see buying a case! The Domaine de Pellehaut wine is a blend of Ugni Blanc, Colombard, Folle Blanche, Chardonnay, Sauvignon Blanc, Gros Manseng, and Petit Manseng. Slightly off-dry and medium-bodied, we opened this bottle when our guests sat down to the table, thinking it would be an interesting comparison to the first wine and possibly a nice complement to the foie gras, duck, veal, and pork terrine with its buttery crust. On its own, it was a surprising contrast to the first wine and its appeal definitely benefited from its marriage with the meat terrine. I think I may have liked it better with dessert, but there was none left to try so I guess that everyone enjoyed it with the terrine! Half the fun of getting to know new wines is experimenting with wine and food pairings. This wine retails for $10 to 14 which may tempt us to try it again. 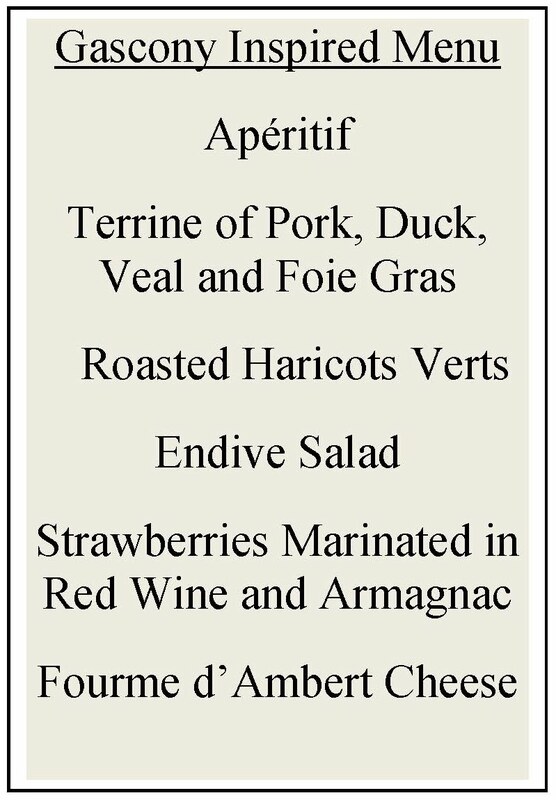 We wanted to pair a red wine with the terrine, too. The third Sud-Ouest wine came from Cahors, an AOP district, northeast of Gascony and directly north of Toulouse. This appellation is the birthplace of the popular Malbec grape (now, also, associated with Argentina). Known locally as Cot or Auxerrois, this grape has been cultivated in the Cahors area for over 800 years and was the dominant black grape variety until the devastating phylloxera plague in the 19th century and then, in the 1950s, the deadly frosts. In 1971, Cahors was awarded AOC status. This Clos La Coutale (2009) wine of 80% Malbec and 20% Merlot made for an excellent marriage of flavors, one that I preferred over the off-dry white wine. The real wine star of the meal was the Saint Albert off-dry white from the appellation Pacherenc du Vic-Bilh, which was part of the old region of Gascony. It is produced by the Plaimont winery. This lovely wine—a “bright straw color”—elicited audible oohs and ahs. “It tastes like a pot of honey,” one person said. Everyone concurred. Others tasted vanilla with an ever-so-faint floral essence. The fine structure of this wine, made from Gros Manseng and Petit Manseng grapes, nicely supports an alcohol content of 13%. 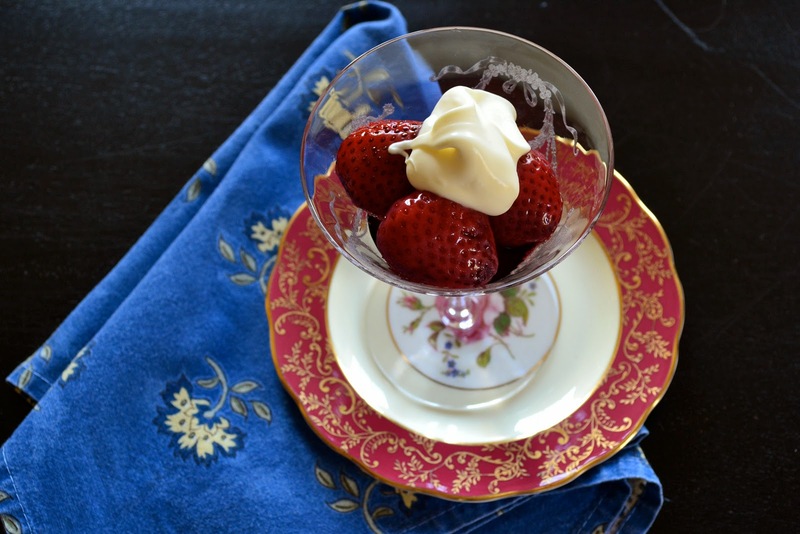 It was the perfect match for our dessert of fresh strawberries that had marinated in Armagnac and red wine. With a dollop of crème fraîche, it was a heavenly pair. The average price of this wine is $24 and is well worth it. I can hardly wait to have it again. Finally, we served each person a tiny morsel of the Fourme d’Ambert Cheese to be enjoyed with the Saint Albert wine or a small snifter of Armagnac. Our Gascon meal transported the dinner party to the Southwest region of France. In the South of France, I have only traveled as far west as Toulouse but, now, I long to go deeper into the luscious green countryside to visit medieval hilltop villages, fortified villages, châteaux, and to enjoy what they refer to as the douceur de vivre. Ah, the sweetness of life was certainly around our table. Post Script: While I was writing this post, Win Rhoades of South Street and Vine Wine and Cheese store, called to tell me that he had just gotten in a Côtes de Gascogne wine. Naturally, I walked over and picked it up: a Domaine de Pouy made of 60% Ugni Blanc and 40% Colombard. What a treat—light, crisp, refreshing, and even inspiring on a hot afternoon. At $14, this bottle will be in my wine cellar this summer. (Win says that it may go on sale, too!) Like all the Gascon wines we discovered, it’s a good wine at a really reasonable price! I have indeed tried the Miraval rosé and loved it! I wrote a post about it in May–I hope you will check it out! I hope you enjoyed it with your dinner! Have you had any success? I am very curious if you can find the melons in Malta. Glad you can get the melons! Good do know that I would have some sympatico company in the kitchen! No luck yet on the Gascone wines (but I haven’t revved up into serious ‘research mode’ yet), and the Cavaillon melons seem to be available only with the ‘better’, more up- market, green grocers. Locally produced melons are now in abundance, so anything else is difficult-to-impossible to find! But I love little ‘detective projects’ such as these, so will keep you posted. It is so fun to have you as a reader! Let me know if you find either–in fact, I think they might go well together! Readers might be interested to know that Cloe is the proprietress of “Goddess Tours to Malta” (http://www.goddesstourstomalta.com/cloe.html) and, as such, plans tours of Malta and Gozo. I have always wanted to take one of her tours! Thanks again for your comment, Cloe, and keep us posted! We are all salivating as we wait for the terrine! It was terrific as was the entire dinner. In the meantime, I hope your readers will try the strawberry dessert, which was simply elegant! The wines from Gascony, Pacherenc du Vic Bilh,and Cahors, (and our Châteauneuf du Pape wine!) were wonderful, weren’t they? !